We are so enthused about Angela's Residential Care home, because we are such fans of Angela. In our work we see a wide-range of senior care facilities. And, with our mother who lived to the age of 99 we have personally experienced a variety these centers. Senior care, no matter the facility, ultimately is measured by the people who perform the caring. Angela's Residential Care has both a fine, brand new facility and the best of personal care. To know Angela is to know the most unique spirit of love you'll ever encounter in a senior care facility. As we have come to know Angela, we have come to know her heart and passion for making a difference, therefore we are big fans of all she endeavors to do. Angela's Residential Care can be your home or home for your loved ones. We have taken great care to make this the most comfortable experience possible...like coming home. The personalized and tender care is what everyone is seeking. You can count on Angela's Residential Care facility to be the most secure and enjoyable place to be! Monitoring and observation for changes in physical, mental, emotional and social functioning. Notification to resident’s family, physician and other appropriate person/agency of resident’s needs. Food service: Three nutritious meals per day and between meal snacks and special diets, if physician prescribed. Plan, arrange and/or provide for local transportation to medical and dental appointments. A personalized activity program including arrangement for utilization of available community resources. Assistance with activities of daily living, including bathing, dressing and grooming. Assistance with taking prescribed and over-the-counter medications in accordance with physician’s instruction, unless prohibited by law or regulation. Bedside care and tray service for minor temporary illness or recovery from surgery. Care for people with terminal illness, working with hospice agencies. Large, new furnished private room with private bathrooms. 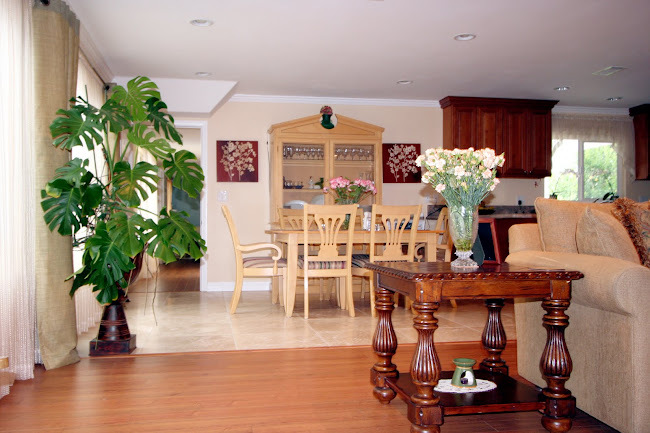 Cable TV, phone and wireless internet access throughout the house. Main living room and dining room are for socializing. Patio and backyard for inside/outside enjoyment and activity. Angela's Residential Care not only offers many options for people who have different needs, but also a strong desire to maintain their privacy and independence in beautiful private rooms with private bathrooms, in a home-like setting. Angela and her staff team of care-givers and administrators offer individualized attention and care for you or your loved one. We understand the importance of caring for the whole person mentally, physically and spiritually. Families and friends are encouraged to join us at any time. Angela's Residential Care is the perfect alternative for seniors who can no longer live on their own at home, yet don’t need 24 hours, complex medical supervision. Our approach provides the ideal solution for seniors who need help with daily activities such as bathing, dressing and management of medication.